May and Annie are sisters living on the Isle of Wight at the end of the nineteenth century, but they couldn't be more different. May is a great reader while Annie is "blind", or dyslexic. After their mother dies these Victorian girls are forced to pool their skills in order to understand the gaps in their family history. An encounter with a mysterious uncle in London puts Annie in charge for a change, and leads to a surprising reconciliation. 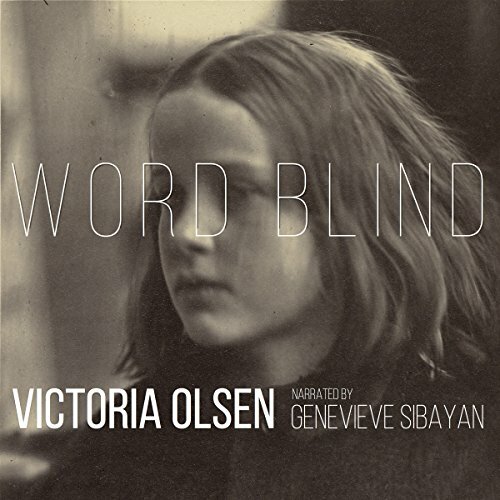 "Word Blind" was a lovely short story about two sisters, Annie and May whom one could read very well and the other had trouble with words. Annie was frustrated that she had trouble with words and her father thought that perhaps she was slow or lacking something. In those days there wasn't a word for dyslexia. This was a beautifully told double narrative from each sister's point of view. I love how this audiobook was presented and I felt that it was thought-provoking as well as a delightful listen. Definitely recommended. Genevieve Sibayan did a fabulous job narrating this book. She has a soft voice which was perfect for the story. She differentiated the sisters, one having a slightly younger voice than the other and her voice inflections were terrific. A great match of author/reader. If you could sum up Word Blind in three words, what would they be? It warmed my heart! Can't think of anything else to say that wouldn't spoil it. What does Genevieve Sibayan bring to the story that you wouldn’t experience if you just read the book? Oh, I absolutely LOVED the quality of her voice! It's a voice that you really want to keep listening to. I'd likely keep listening to a book I didn't like, just to listen to her. I love how she says the name Annie. The part when Annie overhears her father telling someone how she was stupid made me think deeper about an issue that I do not have. It helped me understand better. a child and their family. This was a fascinating book.Annie and May are sisters,While one is a great reader and thinker,the other is a visual person and can not read.Feeling alone Annie come into contact with an uncle who is also 'word Blind'.Between the two girls ,they make their way into a brand new world.There is a sense of history to this book.I loved it!I was given this book free of charge for an honest review. This book was not for me. *I was given a copy to listen to in exchange for my review. I really tried to give it a fair shot, but even with less than an hour to go, I still hadn't had anything or character grab my interests. Perhaps it was the setting, perhaps it was the story but I just could not get into it, it didn't keep my interest and I'm sorry that it didn't grab me. It is hard for me to write reviews for those few books whose topic for story just do not have me invested or care about the characters. While it wasn't a story for me to understand or enjoy, perhaps there is a larger audience who would grasp and be drawn in by such a book. I have mad respect for authors who put themselves out there, so I give kudos for that. The narration was very good, but the subject matter made it very difficult for the performer, in my opinion, to be engaged in care for these characters and the problems they face and the expectations they seek. I usually enjoy leaving reviews, but not this time. Reviews written by others before I purchase a book are important. If you found my review helpful in your decision about this book, would you please select yes directly below this paragraph? Thank you so much. Please consider "following me" here on Audible.com. I purchased a lot of books by authors that I am faithful to. I also have the opportunity to review books in all genres, many that I would not pick up on my own. I have been pleasantly surprised by new authors and narrators. Thanks!